Sweetener is the fourth studio album by American singer Ariana Grande. It was released on August 17, 2018, through Republic Records. The album is the follow-up to her 2016 studio album, Dangerous Woman, and features guest appearances from Pharrell Williams, Nicki Minaj and Missy Elliott. The album received critical acclaim, debuting at number one on the US Billboard 200 with 231,000 album-equivalent units in its first week of which 127,000 were from pure sales. The album was Grande's third release to reach the top position in the country, and subsequently marked the largest opening week numbers of her career until Thank U, Next (2019). It also topped several international album charts, including in Australia, Belgium, Canada, Ireland, Italy, New Zealand, Norway, Portugal, Spain, Sweden, Switzerland and the United Kingdom, earning a gold certification in the latter. Sweetener won the Grammy Award for Best Pop Vocal Album at the 61st ceremony, marking Grande's first career Grammy win. The album received critical acclaim, debuting at number one on the US Billboard 200 with 231,000 album-equivalent units in its first week of which 127,000 were from pure sales. The album was Grande's third release to reach the top position in the country, and subsequently marked the largest opening week numbers of her career until Thank U, Next (2019). It also topped several international album charts, including in Australia, Belgium, Canada, Ireland, Italy, New Zealand, Norway, Portugal, Spain, Sweden, Switzerland and the United Kingdom, earning a gold certification in the latter. Sweetener won the Grammy Award for Best Pop Vocal Album at the 61st ceremony, marking Grande's first career Grammy win. The album has spawned three top-twenty singles in the United States. The lead single, "No Tears Left to Cry", was released on April 20, 2018 alongside its music video, and debuted at number three on the Billboard Hot 100. "The Light Is Coming", featuring Minaj, was released as a promotional single on June 20, 2018, along with the pre-order of the album. "God Is a Woman" was released as the second single on July 13, 2018, and peaked at number eight, while the third single "Breathin" debuted at number 22 following the album release and has since reached number 12. Grande embarked on The Sweetener Sessions tour on August 20th 2018 - September 4, 2018 to promote the album. She will embarked on the Sweetener World Tour, starting on March 18th, 2019. She will promote both the Sweetener album as well as her fifth studio album, Thank U, Next. On November 13, 2016, Grande stated on Snapchat that she had finished her fourth album. She later clarified by saying, "I didn't mean to make an album, and I don't know if it's done at all, but I just have a bunch of songs that I really really like. I've been working a lot and have been creating and feeling inspired." In December 2017, she confirmed that she was still working on the album. Grande's manager Scooter Braun told Variety that the album has a more mature sound: "It's time for [Ariana] to sing the songs that define her ... Whitney, Mariah, Adele – when they sing, that's their song. Ariana has big vocal moments; it's time for her song." Pharrell Williams told Los Angeles Times: "The things that [Ariana] has to say on this album, it's pretty next-level." Producers Max Martin and Savan Kotecha were later confirmed to have collaborated with Grande in the album. On December 28, 2017, Grande shared several pictures of her in the studio throughout the year. The following week, Grande shared a snippet from the album on her Instagram, which was later revealed to be a track titled "Get Well Soon". On April 16, 2018, it was reported that Grande may move up the lead single release to April 20, 2018, due to labelmate Post Malone's album being released on April 27. On April 17, 2018, Grande announced that the album's lead single, "No Tears Left to Cry", would be released on April 20, 2018. On The Tonight Show Starring Jimmy Fallon, Grande announced that her album would be called Sweetener. She said the meaning behind the title is "It's kind of about like bringing light to a situation, or to someone's life, or somebody else who brings light to your life, or sweetening the situation." A May 2018 cover article in Time magazine by Sam Lansky notes that, for the first time with this album, Grande "took the lead on writing". In late May 2018, she announced that the album would feature 15 tracks and three collaborations, which are Missy Elliott, Nicki Minaj and Pharrell Williams. In early June 2018, Grande announced at Wango Tango that the album would be available for pre-order on June 20, and "The Light Is Coming" would be released along with it. The second single, "God Is a Woman", was initially scheduled to be released on July 20, 2018, however, she later moved the release forward a week to July 13. Prior to the album's release, Spencer Kornhaber of The Atlantic commented that the first three singles from the album "sparked with a sense of defiance and rattled mortality ... [a] trifecta of pseudo-spiritualism and sneaky innovation. ... Grande's music and videos radiate [intoxicating, unworried confidence]". — Ariana Grande on the album's sound. Sweetener consists mostly of pop, R&B, and trap songs that include elements of house, funk, neo soul and hip hop music on its beats and productions. The melodies and harmonies on the album are diverse and include uptempo songs and many different down tempo sentimental ballads. It explores a diversity of other music genres, including tropical house, EDM, synthpop and minimalist urban influences. Stephen Thomas Erlewine from Allmusic stated that the album "deepens the R&B inclinations of 2016's Dangerous Woman." In an interview with Zach Sang she said: "Listen, the thing that I love most about this project sonically, is that all I really did was sing in my sweet lower register". The album begins with 38-second a cappella intro, "Raindrops (An Angel Cried)", written by Bob Gaudio and performed by The Four Seasons. The song is known to completely show Grande's vocals. "Blazed" is a high tempo funk-influenced song. It features vocals and background vocals by Pharrell Williams, who also produced the track. She first admitted the name of the song on her Twitter account. Lyrically, it is about "loving someone and being with them." "The Light Is Coming" merges hip hop and R&B elements. Grande sings the lyrics "The light is coming / to give back everything the darkness stole". Which is sung over a "jittery beat" that is used with quick drums and synths. It samples a CNN archive clip of a man who is shouting at former senator Arlen Specter at a town hall meeting in Pennsylvania in 2009 concerning healthcare ("You wouldn't let anybody speak for this and instead!"). Israel Daramola described the song as a "glitchy, thumping" dance record with a sample that highlights Grande's "nursery rhyme-style melody" "R.E.M" is an R&B song that is built over a smooth doo-wop beat. The song's title stands for "rapid eye movement", which is where memorable and vivid dreams occur. In an interview with Jimmy Fallon for the Tonight Show, she admitted that "R.E.M" was her favourite song. She later confirmed on Twitter that "R.E.M." is a song based on Beyoncé's demo titled "Wake Up", a leftover from the singer's 2013 self-titled album. The track "God Is a Woman" contains lyrics about female sexual empowerment and spirituality; Time described the song as "an anthemic, sultry banger". a trap-pop song, "God Is a Woman" contains influences of reggae. and is performed in the key of E♭ minor with a tempo of 72–76 beats per minute. "Sweetener" (which is the title track) was the first song that Grande recorded for the album, and it features Williams vocals in the background similar to "R.E.M". Being a trap-inspired song, the chorus contains the lyrics "When life deals us cards / Make everything taste like it is salt / Then you come through like the sweetener you are." which symbolises empowerment. "Successful" is a 90s-inspired neo soul song, that has elements of gospel and trap. Lyrically, it's about "girls feeling good about their own individual success." "Everytime" is a "trap-pop" song that contains a pop-rap chorus. "Breathin" is a dance-pop song that contains influences of synthpop. The Independent called the song an "emotional highlight" and that it is a "mental health bop over a good, solid pop beat." Lyrically, it is about Grande's overcoming growth from anxiety. "No Tears Left To Cry" is a dance-pop and disco song with a UK garage beat. and was served as the first official single for the album. Lyrically, it is about the Manchester Arena bombing. "Borderline" is a 90s contemporary R&B song features American rapper Missy Elliott. It's one of Grande's favourites on the album. "Better Off" is a ballad that discusses a toxic relationship. "Goodnight n Go" is an EDM song with deep house and tropical influences. It contains a sample of "Goodnight and Go", written and performed by Grande's inspiration Imogen Heap. In an interview with Billboard Heap said that "it feels like a gift". She went on saying: "When somebody that famous picks up on a song that has had its day and gives it a second life, it's a real gift. I think she's done a lovely version of it." "Pete Davidson" is an interlude of the album and has a trap and hip hop production. Lyrically, it is about her then-fiancé, Pete Davidson. "Get Well Soon" is a soul-ballad that has a laid back R&B melody. At the end of the song, 40 seconds of silence are played as a tribute to the twenty-two victims of the Manchester Arena bombing, which took place after her concert on May 22, 2017. Grande went silent on all social media after sharing a snippet of a song from the album on December 31, 2017. On April 17, 2018, Grande broke her silence by sharing a teaser of the album's lead single, "No Tears Left to Cry", which was released on April 20, 2018, alongside its music video. In the music video, she teased the album by writing some of the song names, including "God Is a Woman", "Breathin", "R.E.M", "Successful", "Sweetener", "Borderline" and the first 3 letters of "Blazed", which was teased again in a behind-the-scenes video. She first performed the song at Coachella later that night, as a guest during the performance of DJ Kygo. Grande announced the title of the album and several song titles on The Tonight Show Starring Jimmy Fallon on May 1, 2018, shortly before performing "No Tears Left to Cry". She also opened the 2018 Billboard Music Awards with a performance of the song on May 20, 2018. On June 2, 2018, Grande performed at Wango Tango in California, closing her set with a performance of "No Tears Left to Cry" and also sharing a snippet of "The Light Is Coming". On August 8, 2018, three dates were announced for a series of promotional concerts in the United States, titled The Sweetener Sessions, in partnership with American Express. Grande also announced a world tour in support of the album. The tour, titled Sweetener World Tour is scheduled to begin on March 18, 2019. The album's lead single, "No Tears Left to Cry", was released on April 20, 2018 alongside its music video. The track debuted at number three on the US Billboard Hot 100, becoming Grande's ninth Hot 100 top 10 and sixth to debut in the top 10, tying Grande with Lady Gaga and Rihanna in sixth among acts with the most top 10 debuts on the chart. The single made Grande the first artist in the chart's 60-year history to debut in the top 10 with lead single from each of her first four albums. In conclusion, the song also topped the Mainstream Top 40 chart in July 2018, reached number one in nine countries and top-ten in twenty others, and was later certified platinum by the Recording Industry Association of America (RIAA) in July 2018 for shipments exceeding a million equivalent units in the US. The second single, "God Is a Woman", was released on July 13, 2018, with its music video premiering 12 hours after the song's release. The single debuted at number eleven on the Billboard Hot 100 and peaked at number eight, making it Grande's tenth top ten song on the chart and placing her as the twelfth overall artist and seventh female artist with the most Hot 100 top 10s in the 2010s decade. The song also became Grande's second single to top the US Mainstream Top 40 airplay chart from Sweetener, and third overall. "Breathin" was released to US contemporary hit radio as the third and final single from the album on September 18, 2018. The song has debuted number 22 on the Billboard Hot 100, and peaked at number 12. Its music video, directed by Hannah Lux Davis premiered on November 7, 2018 on her YouTube account. A promotional single, "The Light Is Coming", featuring Nicki Minaj, was released on June 20, 2018, along with the pre-order of the album. The song debuted at number 95 on the Billboard Hot 100 and later peaked at number 89, after the release of the album. At Metacritic, which assigns a normalised rating out of 100 to reviews from mainstream critics, Sweetener has an average score of 81 based on 20 reviews, indicating "universal acclaim." In The New York Times, Jon Pareles wrote that Grande's voice "can be silky, breathy or cutting, swooping through long melismas or jabbing out short R&B phrases; it's always supple and airborne, never forced. … Ms. Grande sails above any fray, past or present. Her aplomb is her triumph." Brittany Spanos of Rolling Stone called the album "a refreshing, cohesive package. … [The producers' approach lets] Grande's easy way with trap phrasing find a home next to her flair for Broadway-esque dramatic runs"; it combines "the sensual romance of the album's plentiful love songs and the aching heartbreak of the others." Spanos concludes that it is Grande's "best album yet, and one of 2018's strongest pop releases to date. Kate Solomon of The Independent commented that with music that is "often unexpected, sometimes in a good way, it is an album by an artist in flux – trying to move forward while reluctant to fully relinquish old ideas." Writing for NME, Douglas Greenwood deemed the album "[a] confident, accomplished, sometimes left-field collection of pop bangers, proving that she's not shy of experimentation." He also commented that "there are a couple of songs on Sweetener that you'd happily leave on the shelf." Similarly, in The Guardian, Alexis Petridis said that "her collaborations with Pharrell really push the boundaries. But they make the rest of this album seem formulaic." He considered the album "uneven", with its attempts to balance out what Grande called a "weird" record. Petridis felt that "the world could use more pop music as imaginative as Sweetener's highlights." Neil McCormick in The Daily Telegraph felt that "the quality of the songs is high, although there are moments when they might be trying too hard to demonstrate that the teen queen is all grown up now," and argued, "as modern, branded, blockbuster pop albums go, Sweetener is a delightful confection." He commented less favorably about guest rappers Nicki Minaj and Missy Elliott, who "sound like they dialled in clichéd verses for a pay cheque." In the United States, Sweetener opened at number one on the US Billboard 200 with 231,000 album-equivalent units, of which 127,000 were from traditional album sales, thus becoming Grande's third number-one album in the United States. It also logged the largest streaming week for a non-hip hop album by a female artist; the songs were streamed 126.7 million times in the album's first week. On the US Billboard Hot 100 chart issue dated September 1, ten songs (nine of which are from Sweetener) appeared simultaneously, placing Grande as the fourth female artist with the most simultaneous entries on the chart by a solo female artist behind Taylor Swift, Beyoncé, and Cardi B. Grande also topped the Artist 100 chart the same week due to album sales and song streams. In its second week, Sweetener dropped to number four moving 75,000 equivalent album units, while in its third week, it fell one position to number five moving an additional 56,000 equivalent album units. In the United Kingdom, Sweetener debuted at number one on the UK Albums Chart, moving 45,000 album-equivalent units. It became her second number-one album in the UK, and her fastest selling album to date. Following its release, two album tracks entered the UK Singles Chart as "Breathin" debuted at number 8, and "Sweetener" landed at number 22, while the single "God Is a Woman" ascended six places to number 6. In Australia, the album became Grande's third number one on the ARIA Albums Chart, with all 15 of its tracks placing on the ARIA Singles Chart in the same week. In 2018, Sweetener was ranked as the 38th most popular album of the year on the Billboard 200. As of January 2019, Sweetener has moved 964,000 album-equivalent units in the US, with 213,000 being pure sales. "Raindrops (An Angel Cried)" is an a capella cover of "An Angel Cried", a 1964 song written by Bob Gaudio and performed by The Four Seasons. "R.E.M" contains a sample elements of Beyoncé's unreleased demo entitled "Wake Up". Credits adapted from the liner notes of Sweetener. ↑ "Ariana Grande on Twitter". Retrieved June 7, 2018 – via Twitter. 1 2 3 4 5 6 7 Mapes, Jillian (August 21, 2018). "Ariana Grande: Sweetener". Pitchfork. Retrieved August 21, 2018. 1 2 3 4 McCormick, Neil (August 17, 2018). "Ariana Grande, Sweetener review: Out of the darkness came sweetness". The Daily Telegraph. Retrieved August 17, 2018. ↑ "Ariana Grande Taps Nicki Minaj for New Song "The Light Is Coming": Listen". Pitchfork. June 20, 2018. Retrieved June 20, 2018. ↑ "Ariana Grande Is Already Working On Her Fourth Album". Idolator. November 13, 2016. ↑ Diderich, Joelle (November 22, 2017). "Pharrell Williams' latest Adidas Originals collaboration is a super-exclusive pair of co-branded Chanel kicks". Los Angeles Times. ↑ Aswad, Jem (April 9, 2018). "Ariana Grande to Drop First Single From New Album on April 27". ↑ Lansky, Sam (May 17, 2018). "Ariana Grande Is Ready to Be Happy". Time. 1 2 "Ariana Grande on Twitter". Retrieved July 12, 2018 – via Twitter. 1 2 3 4 Spanos, Brittany (August 20, 2018). "Review: Ariana Grande Finds Serenity and Has Some Fun on Sweetener". Rolling Stone. Retrieved August 20, 2018. 1 2 3 4 5 6 7 8 Erlewine, Stephen Thomas. "Sweetener – Ariana Grande". AllMusic. Retrieved August 23, 2018. ↑ "Sweetener by Ariana Grande on Spotify". Spotify. August 17, 2018. Retrieved September 20, 2018. ↑ Farley, Rebecca (May 2, 2018). "Everything We Know About Ariana Grande's New Album Sweetener". Refinery29. Retrieved September 20, 2018. ↑ Aniftos, Rania (August 17, 2018). "Pharrell on Working With Ariana Grande on 'Sweetener': 'She Really Unzipped'". Billboard. Retrieved September 20, 2018. ↑ Grande, Ariana (May 30, 2018). "the one with P isss called Blazed". Twitter. Retrieved September 20, 2018. ↑ "Ariana Grande Taps Nicki Minaj for New Song "The Light Is Coming": Listen". Pitchfork. June 20, 2018. Retrieved September 20, 2018. ↑ "Hear Ariana Grande Tap Nicki Minaj for Snappy 'The Light Is Coming'". Rolling Stone. June 20, 2018. Retrieved September 20, 2018. ↑ "Ariana Grande's 'The Light Is Coming' Contains a Prominent Voice Sample With a Political Message". Billboard. June 21, 2018. Retrieved September 20, 2018. ↑ "Ariana Grande Predicted She Would Marry Pete Davidson Three Years Ago". YouTube. Retrieved September 20, 2018. ↑ Lansky, Sam (May 17, 2018). "Ariana Grande Is Ready to Be Happy". Time. Retrieved September 20, 2018. 1 2 3 4 Greenwood, Douglas (August 17, 2018). "Ariana Grande – 'Sweetener' review". NME. Retrieved August 17, 2018. ↑ ""girls feeling good about their own individual success."". Twitter. Retrieved September 20, 2018. ↑ "Ariana Grande Predicted She Would Marry Pete Davidson Three Years Ago". YouTube. August 16, 2018. Retrieved September 20, 2018. ↑ Caramanica, Jon (April 20, 2018). "The Playlist: Prince's Own 'Nothing Compares 2 U,' and 12 More New Songs". The New York Times. Retrieved September 20, 2018. ↑ Savage, Mark (April 20, 2018). "No Tears Left To Cry: Ariana Grande's uplifting new single alludes to Manchester". BBC Music. Retrieved September 20, 2018. ↑ Briones, Issis (September 27, 2017). "48 Hours in Hong Kong With Ariana Grande". Billboard. Retrieved September 20, 2018. ↑ "Replying to @sweetaner @bedwithgrande". Twitter. June 17, 2017. Retrieved September 20, 2018. ↑ "Sweetener by Ariana Grande on iTunes". Apple Music. August 17, 2018. Retrieved September 20, 2018. ↑ Grande, Ariana (June 7, 2018). "issa remix & a cover w a few new parts". Twitter. Retrieved September 20, 2018. ↑ Kaplan, Ilana (August 24, 2018). "Imogen Heap Talks Ariana Grande's Version of 'Goodnight and Go': 'It's a Real Gift'". Billboard. Retrieved September 20, 2018. 1 2 3 Petridis, Alexis (August 19, 2018). 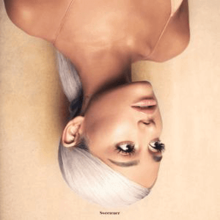 "Ariana Grande: Sweetener review – pop's ponytailed paragon gets weird". The Guardian. Retrieved August 19, 2018. ↑ Barbour, Shannon (August 17, 2018). "Fans Think Ariana Grande's New Song "Get Well Soon" Is a Tribute to the Manchester Bombing Victims". Cosmopolitan. Retrieved September 20, 2018. ↑ Rincón, Alessandra (August 17, 2018). "Fans Speculate Ariana Grande's Sweetener Track "Get Well Soon" Is 5:22 Long to Honor Manchester Attack". Billboard. Retrieved September 20, 2018. ↑ Blais-Billie, Braudie; Minsker, Evan (May 1, 2018). "Watch Ariana Grande Cover Kendrick in the Style of Evanescence on "Fallon"". Pitchfork. ↑ "No Tears Left to Cry Certification". Recording Industry Association of America. Retrieved November 30, 2018. ↑ "Sweetener by Ariana Grande reviews". AnyDecentMusic?. Retrieved August 28, 2018. 1 2 "Sweetener by Ariana Grande Reviews and Tracks". Metacritic. Retrieved August 31, 2018. ↑ Fitzmaurice, Larry (August 20, 2018). "Ariana Grande's Sweetner is a sneakily complex pop album". Entertainment Weekly. Retrieved August 20, 2018. 1 2 Solomon, Kate (August 17, 2018). "Ariana Grande, Sweetener review: A portrait of an artist in flux". The Independent. Retrieved August 17, 2018. ↑ Bruton, Louise (August 17, 2018). "Ariana Grande: Sweetener – celebrating the art of being okay". The Irish Times. Retrieved August 17, 2018. ↑ Hodgkinson, Will (August 17, 2018). "Pop review: Ariana Grande: Sweetener". The Times. Retrieved August 17, 2018. (Subscription required (help)). ↑ Firth, Abigail (December 3, 2018). "The Best Albums of 2018". The Line of Best Fit. Retrieved December 10, 2018. ↑ "The 50 Best Albums of 2018". Pitchfork. Retrieved December 11, 2018. ↑ "The 50 Best Albums of 2018". Rolling Stone. December 13, 2018. Retrieved December 14, 2018. ↑ "20 Best Pop Albums of 2018". Rolling Stone. December 14, 2018. Retrieved December 14, 2018. ↑ Macki, Johnni (September 5, 2018). "2018 People's Choice Awards: Complete List of Nominations". E!. United States. Retrieved December 7, 2018. ↑ Zellner, Xander (August 28, 2018). "Ariana Grande Returns to No. 1 On the Artist 100 Chart, Aretha Franklin Reaches No. 2". Billboard. Retrieved September 30, 2018. ↑ "Official Singles Chart Top 100: 24 August 2018 – 30 August 2018". Official Charts Company. Retrieved August 25, 2018. ↑ "Top 50 Albums of 2018". HITS. ↑ Sweetener (booklet). Ariana Grande. New York City: Republic Records. 2018. B002881502. ↑ "Sweetener by Ariana Grande". Tidal. Canada. Retrieved January 23, 2019. ↑ Farley, Rebecca (May 2, 2018). "Everything We Know About Ariana Grande's New Album Sweetener". Refinery29. Retrieved August 18, 2018. ↑ "Le Top de la semaine : Top Albums – SNEP (Week 34, 2018)". SNEP. Retrieved August 27, 2018. ↑ "Japanese Hot Albums" (in Japanese). Billboard Japan. Retrieved September 3, 2018. ↑ "Gaon Album Chart – Week 36, 2018" (in Korean). Gaon. Retrieved September 13, 2018. ↑ "South Korean Oversea Albums". Gaon. Retrieved December 31, 2018. ↑ "South Korean Oversea Albums - September 2018". Gaon. Retrieved December 31, 2018. ↑ "Brazilian album certifications – Ariana Grande – Sweetener" (in Portuguese). Associação Brasileira dos Produtores de Discos. Retrieved December 22, 2018. ↑ "Canadian album certifications – Ariana Grande – Sweetener". Music Canada. Retrieved November 16, 2018. ↑ "French album certifications – Ariana Grande – Sweetener" (in French). Syndicat National de l'Édition Phonographique. Retrieved January 14, 2019. ↑ "Italian album certifications – Ariana Grande – Sweetener" (in Italian). Federazione Industria Musicale Italiana. Retrieved January 28, 2019. Select "2019" in the "Anno" drop-down menu. Select "Sweetener" in the "Filtra" field. Select "Album e Compilation" under "Sezione". ↑ "Ariana Grande – Sweetener" (in Swedish). Grammofon Leverantörernas Förening. Retrieved October 7, 2018.